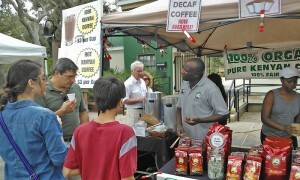 Outdoor markets are great for finding crafty gifts, fresh produce and locally produced goods. While most markets are only open on weekend mornings, the St. Augustine Amphitheater offers a great chance to enjoy the market experience on a weeknight. The St. Augustine Amphitheater Night Market is open the second and fourth Tuesday of each month from 6 to 9 p.m. Come peruse the more than 70 vendors and enjoy dinner options and live music. The next market, scheduled for August 14, will feature Davis & the Loose Cannons as well as The Space Heaters. The August 28 market will feature the Wild Shiners. The Night Market is free and open to the public with free parking. Gather the family after work and head to the Night Market for shopping, eating and fun! No pets please. For more information and updates, visit https://www.facebook.com/staugampmarket, email staampmkt@gmail.com or call (904) 315-9252. The St. Augustine Amphitheater is located at 1340C A1A South.